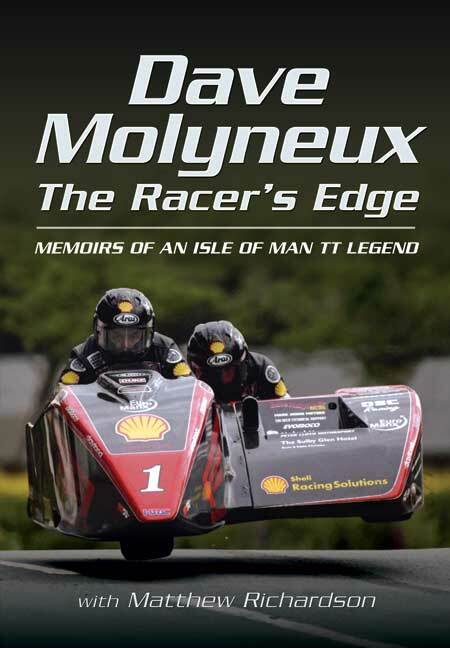 You'll be £4.99 closer to your next £10.00 credit when you purchase Dave Molyneux The Racer's Edge. What's this? Dave Molyneux is one of the most prolific and determined sidecar racers in British history. His racing career has spanned an incredible thirty-one years. He has dominated the sidecar class at the Isle of Man TT, the most demanding road races in the world, with an exceptional tally of 14 wins, making him the most successful sidecar competitor in the history of the event. He has competed in British and European championships, Grands Prix and other races. This book tells, in his own words, his remarkable story. It describes his victories and defeats, the accidents and the other setbacks he has overcome, and reveals what makes him such an accomplished engineer as well as a racer. Dave Molyneux is the most successful sidecar racer in the history of the TT with 14 wins. He holds the race record for the Sidecar TT at 58 minutes and 59.28 seconds, an average race speed of 115.132 mph over 3 laps, achieved in 2009. As well as dominating the event as a competitor, he has established an exceptional reputation as a sidecar designer and constructor – and as a sometimes outspoken commentator on the sport. Sidecar fan or not, great book. The best insight into the behind the scenes activities in the world of international sidecars and for those with an interest in the Isle of Man especially just brilliant. I enjoyed this as a very grounded insight into the "everyday life" of this legend of sidecar racing and the TT over his many years of winning competition . Plus a good amount of technical and historical facts on sidecar racing and the TT to keep the enthusiast enthralled. This is a great Kindle book - for once accurately transcribed with no typos! Great subject matter by a guy who has worked so hard for his achievements in sidecar racing and reveals an insight to his character which I didn't expect to find. A real insight into the mind-set of a sidecar champion, Dave Molyneux Comes across as a true enthusiast in this interesting book! Excellent book that really got down to the nitty gritty of competing in this death defying sport.Technically excellent with the real facts of the financial burdens attached. Superb account of a man who has done so much for the TT.He not only builds and races his own outfits,but he also builds so many for other competitors. A really interesting and a good account of a true champion. I purchased this book because I had developed an interest in this sport and wanted a 'look' behind the scenes. Mr. Molyneux's account provided this admirably, and I would recommend it to like-minded enthuiasts. Dave gives a great insight into the cost of running a competitive sidecar team and the constant struggle he has had to find sponsors. His forthright views of the sport and rivals are refreshing and I would recommend this book to all road racing fans, I also think it would be of interest to fans of all motorcycle sport. This is a brilliant book for anyone who loves the IOM TT, or Sidecars in general. Superbly written, it truly captures the endurance and dedication needed in this sport. It also lays to rest so many of those rumours that have always unfairly followed Moly. A book that had been long overdue and certainly didn't disappoint. This is the story so far, Moly isn't done yet. He almost was, in 2006, when he suffered a potentially career-ending accident, and it is in the aftermath of that event that the two authors' paths intersected and the idea for this book was hatched. His readers will appreciate an up-close pull-no-punches look at his life. The story is current up to 2010; do not infer from the subtitle that only TT racers are covered; British and European championships, Grand Prix and other races are also part of the story. A final chapter deals with his activities as constructor of road racing sidecars under the name DMR which are used by many other TT winners. This book is very readable, and such an easy way for people who have never given sidecars a second thought to get a really good understanding of a thrilling racing machine and the sort of person who can tame it. Dave Molyneux is the most successful sidecar TT racer of all time, with 14 wins to his name, and in this frank biography by Matthew Richardson we get to find out what made Moly so driven. Highly recommended. To people who are new and beginners to racing of any kind you might not have heard of sidecar racing, but fans of the sport will, and will definitely have heard of Dave Molyneux, he is the most successful sidecar racer in the history of the TT, with an incredible 14 wins. He is known for dominating some events and finishing in style, such as in 2009 where he achieved a record of 58 minutes and 59.28 seconds while racing three laps on the Isle of Man TT, this means that he reached an average speed of 115.132 mph. Not only is Dave Molyneux known for his skillful driving and determination to win, but he also has a great talent at designing and building the sidecars, plus he is also known for his appearance as a commentator on the sport. This event is probably one of the hardest racing events of all time, and if a win is achieved it shows a great test of character, having such attributes as endurance, which Dave Molyneux definitely had when he made the record of 58 minutes and 59.28 seconds over 83 1/2 miles. This course is indeed very difficult, ranging from heights between 100 feet above sea level to almost 2000 feet above sea level, with the background ranging from trees to stone walls, but nothing makes this race more intense and fantastic than the great atmosphere that is created by fans traveling from all over the world, just to see this small island perform an amazing event. The legacy of this track builds an intense and nerve-breaking atmosphere for the racers, making them really want to try hard and live up to the fantastic heritage of this place, and that is one thing that Dave Molyneux has done really well. This Biography goes through his highs and lows of his career, from near fatal crashes all the way to his track record, it goes through his thirty-one year career explaining what encouraged him and made him the best he can possibly be that he is today, it shows the hurdles that he has overcome and the defeats that he has had to take , but does show his victories and triumphs on the TT track that has made him the legend that he is today. This biography would be a fantastic buy for anyone who admires Dave Molyneux or loves the sport, because you will not find a better account of motorcycle racing, he is the greatest sidecar racer in history of the track, so this book gives nothing but fantastic and amazing details from the legend himself, making this the best possible book for a fan wanting to know the Isle of Man TT, you cannot read this book without greatly respecting and admiring him. Matthew Richardson is the Curator of Social History at Manx National Heritage. He has organized fantastic exhibitions of the Isle of Man TT in recent years, so he knows greatly the heritage and legacy that this track has, and he will understand how great the achievement is that Dave Molyneux has achieved. Dave Molyneux's sidecar racing career has spanned an enviable thirty one years. He has an incredible tally of fourteen wins at one of the most demanding road races in the world -' The Isle of Man TT' and is regarded as the most successful sidecar competitor in the history of the event. His book documents his hunger and success in a frank autobiography that gives an inside look into the highs and the lows of top level competition . A must read for anyone interested in the sport as it covers not only his immediate career as a sidecar competitor but both that of a designer and constructor and that of an outspoken commentator for the sport . Witty, and brutally honest Molyneux's memoirs is a remarkable and inspirational story of both his victories and defeats on the sidecar circuit. Matthew Richardson is Curator of Social History at Manx National Heritage. He has a long-term interest in military history and has published several outstanding books on the subject including 1914: Voices from the Battlefields, The Hunger War: Food, Rations and Rationing 1914-1918 and Eyewitness on the Somme 1916. He also has a keen interest in the history of the Isle of Man TT and, in addition to producing several acclaimed exhibitions on this subject, worked with Dave Molyneux on The Racer’s Edge: Memoirs of an Isle of Man TT Legend.